_Batman: Young Bruce Wayne mastered all forms of combat after his parents were killed. He uses his wealth to equip himself with the tools to become the great crime fighter. He made his debut in 1939 and was joined by Robin a year later. _Wonder Woman: A figure of strength, beauty and courage, she has been inspiring women since her first appearance in 1941. _Plastic Man: After an accident at a chemical plant gives Eel O'Brian the ability to stretch and alter his shape, he renounces his criminal past and becomes the longest arm of the law. He debuted in 1941. 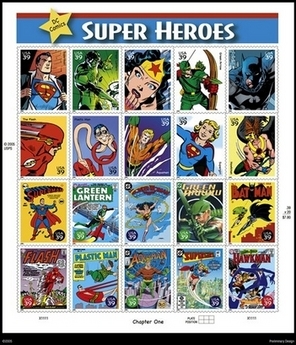 _Superman: The Man of Steel first appeared in 1938 and has been an icon ever since. Raised in Smallville, the baby from Planet Krypton uses superpowers to battle evil. _Green Lantern: Launched with the space age, test pilot Hal Jordan became Green Lantern, a galactic peace officer with an emerald power ring. _The Flash: Police scientist Barry Allen is transformed into the fastest man alive in 1956 by an explosive mixture of lightning and laboratory chemicals. _Aquaman: The former King of the Seven Seas remains is determined to protect both the Atlanteans and surface dwellers from those who endanger them, using his strength, speed and ability to communicate with marine life. _Hawkman: He has artificial wings powered by the mysterious "Nth metal" which allow him to soar through the sky in pursuit of evildoers. He is a master of ancient weapons. _Supergirl: Superman's cousin arrives on Earth as an impressionable teenager and eventually becomes his secret weapon. _Green Arrow: First appearing in 1941, the Emerald Archer learns his skills while trapped on a desert island. He later escapes to become a modern Robin Hood.